Think of Tati and the film Mon Oncle springs to mind, and think of that film and Villa Arpel will appear, the show-box home of Monsieur Arpel. The exhibition Tatirama at the NAi looks at the role of architecture in the films of French filmmaker Jacques Tati. Tatirama revolves around five themes: housing, employment, traffic, recreation and historical heritage. These themes are taken from the 'Charter of Athens' (1943) in which Le Corbusier set out his views on the development of modern architecture. Mon Oncle is about modern living. In Les vacances de Monsieur Hulot (1953) and Playtime, Tati looks at developments in recreation and the changes in people's working lives. 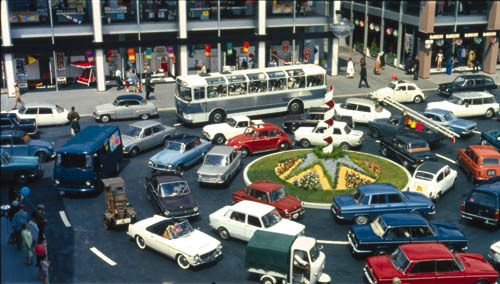 Trafic (1971) deals with the rapid rise in the use of the motorcar. In Playtime historical buildings are always filmed indirectly. The church of Sacre Coeur, for example, is seen reflected in the windows of modern architecture: its heyday has passed. In addition to the model of Villa Arpel and a series of drawings, the exhibition features a number of hanging screens on which film stills are projected. Texts projected onto the images clarify the role of modern architecture and technology in Tati's films. By moving closer and casting a shadow across the screens, visitors discover a second layer of text that explains the context behind Tati's ideas. Plenty of written information therefore, but it's a pity the exhibition contains so little film material. A small video screen shows short fragments from Mon Oncle, Playtime and Trafic. Also on view are five documentaries, on the themes housing, employment, traffic, recreation and historical heritage. A bit more movie footage from Tati's work would have been a good idea, however, especially for all those (young) people who've never actually seen a film by Tati. With films like Mon Oncle (1958) and Playtime (1967), Jacques Tati (1907-1982) made a significant contribution to that small but celebrated group of films in which architecture plays a prominent role; other leading works are Metropolis (1927) by Fritz Lang, The Fountainhead (1949), and the sci-fi Blade Runner (1982). Like other museums in Rotterdam, the NAi is staging the event to coincide with the International Filmfestival Rotterdam, which started last week. In his films Tati offers a humorous critique on modern architecture. He shows how the monoculture, standardisation, transparency, inflated scale and 'emptiness' of this architecture brought about huge change and alienation in people's daily lives. His Villa Arpel in Mon Oncle is fitted out with the latest newfangled gadgetry for home and garden – complete with dolphin fountain that starts spurting when the doorbell rings and kitchen cupboards that open and close automatically. The exhibition features a specially constructed 1:10 model of the villa. Push the buttons and you can let the dog out, move the eyes at the top of the house, and listen to sound fragments from the film. It was Jacques Lagrange who helped Tati create forms that reflected modern times. Jacques Lagrange was Tati's regular set designer from 1953 until the latter's death. Lagrange came from an artistic family, and both his father and brother were architects. At sixteen he entered the Ecole des Arts Decoratifs and later the Ecole des Beaux Arts in Paris. The set drawings on display at the NAi show that neither Tati nor Lagrange left anything to chance. Everything was carefully conceived and designed, and the colourful drawings show that Tati and Lagrange both had a keen eye for detail. 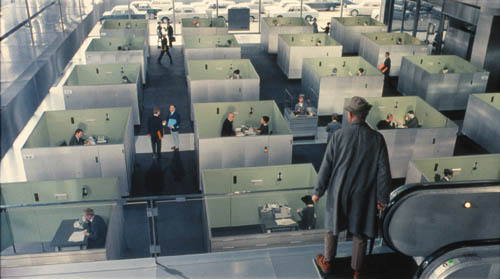 For Playtime (1967) they created in the studio an entire modern city: Tativille. But the influence of Lagrange went beyond sets; together with Tati he also wrote the scenarios and worked out the scenography. The exhibition is curated by the Mission de préfiguration de la Cité de l'architecture et du patrimoine/ Institut français d'architecture (Ifa), Paris. The NAI has adapted the concept and design.